As if by magic, a plot of lawn between Lamont and Northrop houses began transforming early in May. First, a couple of lilacs disappeared.The next morning, the grass was gone, and the soil was turned. Woodchips formed pathways. Finally, seedlings of lettuces, broccoli, staked tomatoes, beets, turnips, and raspberry canes appeared and a sign marked the spot as the new Smith Community Garden. The garden is the venture of a small army of Smith students who, for the past two growing seasons, have raised greens, onions, garlic, tomatoes, and more in hand-constructed raised beds on an off-campus pilot site near the Center for the Education of Young Children. The out-of-the-way site was a perfect place to get their hands dirty, but putting down roots in a prominent spot in the center of campus is a hard-fought dream come true. The committee approved the garden, but assigned it a spot on college-owned land a good bike ride away from campus. In a fenced-in former preschool playground, the gardeners built long wooden garden boxes that they filled with compost collected from college dining rooms. For the first two summers the group planted a lot and learned even more. For instance, they learned that thirsty young gardens demand frequent waterings. They discovered that a pile of woodchips, located next to beds of lettuce, makes a fine home for a family of bunnies. And that the vagaries of New England autumns can mean that those late-harvest hardy greens can, in fact, freeze to death. They also learned that tomato blight takes no prisoners. The new site next to Lamont was approved in April, and a new team of gardeners took up their trowels. Oliverio and Dylan Farrell ’12, a sociology major, led the summer brigade of eight or so students tending the Fort Hill garden and getting the new Lamont garden established. Oliverio was looking forward to the tomato harvest. Farrell, who spent the summer as a counselor at a Hampshire College farm camp, hoped for plenty of basil. While they awaited those crops, they began harvesting leafy greens—kale, mustard, and a variety of lettuces—in June. They enjoyed some great salads, but had plenty left over to sell to the Campus Center Café, which offered Community Garden salads once a week. They also set up a table once a week on campus to sell their produce throughout the summer. These novice gardeners make up in determination what they may lack in experience. 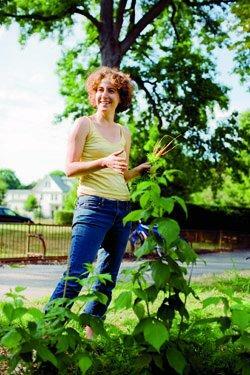 In workshops, they learn about raised beds, organic practices, and how to build a hoop house. And they share their newly acquired expertise. Last year, they made a big batch of applesauce and gave a workshop on canning. “Student-to-student teaching is the main way they build their capacity,” said horticulture lab instructor Gabrielle Immerman, who serves as the group’s faculty adviser. Immerman sees the gardens themselves as an academic resource, not only for the gardeners but for students studying soil science or other horticulture issues. The group, which is a registered student organization with college funding, has a list of ambitions beyond this year’s harvest, such as creating a victory garden that replicates the campus gardens of the World War II years. Immerman hopes to create a summer internship that would keep the garden tended when students are in short supply. “That would help ensure that the garden is full of ripe tomatoes when everyone returns in the fall,” Immerman said.